A MUST READ IF THERE EVER WAS ONE! If ever a book was predestined to be written by an individual, it’s this one, 50 HOURS. You will indeed find a piece of the author in between each line and the pages of the book. If you can read this novel and not shed a tear, you’re stronger than me. Never in my life have I heard of such a personal story unfold while turning a screenplay into a beautiful story. 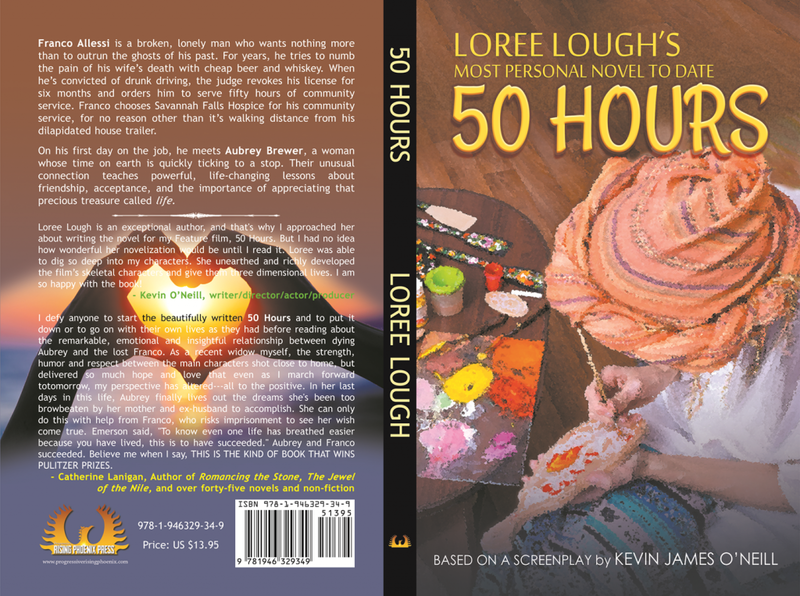 Loree, healthy at the time she was commissioned to write the novel, was diagnosed with a similar terminal illness as her character while researching and writing the novel. What on earth are the odds of that? The shocking diagnosis allowed her to write one of her most memorable novels to date. It is not by any means a depressing story that smacks of defeat or worse self-pity, but of all things is a story of redemption, peace, second chances, friendship, forgiveness and of course, LOVE! The famous novelist Catherine Lanigan (Romancing the Stone, Jewel of the Nile, and a multitude of other works) wrote, “This is the kind of book that wins Pulitzer prizes.” I can’t think of a greater compliment for a literary fiction novel. The realization that millions of others were facing the same prognosis as her character Aubrey (and herself), convinced her to ‘make-like’ her character Franco and put one foot in front of the other to keep moving forward. It was cathartic, and she hoped it would be for readers—not just cancer patients and their families—too. Loree has always believed she was fairly tough. She lived by the “Never let ‘em see ya sweat” and “Never let ‘em see ya cry” codes, she poured her heart and soul into her characters. Aubrey, 50 HOURS, is living with the constant knowledge that her life is slowly ebbing to an end, but she’s determined to squeeze as much joy from every precious moment she has left. Still, she’s lonely, exhausted, and no matter how hard she tries to hide it, terrified! Meeting Franco gives Aubrey a thread of hope to grasp onto, as she realizes that her long-held dream of painting autumn, in of all places Savannah, has come true with his help. Franco, burdened by the belief that he’s partially responsible for the car wreck that killed his wife, turned him into a man who eked out his existence by merely putting one foot in front of the other because he doesn’t know what else to do. After meeting Aubrey, whose zest for life is infectious, his 50 hours of community service tick by, as he finds himself drawn to her strength. Her actual research and interviews proved there are far too many “loved ones” like Aubrey’s ex-husband; Michael who put on a good show of being the dutiful spouse…until the condition, like Aubrey’s, deteriorated, taking the spotlight off him and putting it back on her. It’s an ugly fact, but a fact nonetheless: The occasional loved one will leave. Through Aubrey, Loree hoped to show cancer patients and family members alike that they can survive even that! To me, this story is one of the most beautifully written pieces I’ve ever read, and I read a lot of books, and manuscripts. In this story, as in her A Man of Honor, Loree aimed to give readers a satisfying ending. An ending that would leave readers feeling the story simply couldn’t—shouldn’t—have ended any other way. Even if it did require a few tissues… Franco is a changed man after he meets Aubrey, but you have to read the book to find out how and why. Loree connected and poured herself into Aubrey. Fans and readers will ‘meet’ a piece of her, no doubt, through the pages of this book. She identified almost as closely with Franco as she did with Aubrey. Since, like most people, there are things in her past that she says she’s not proud of (I can’t imagine), but she says there are things she’d rather keep to herself until St. Peter meets her at the pearly gates. That said, she believes there comes a time in every life when regret must take a back seat to reformation. That unless one hopes to spend the rest of their days looking over their shoulders, whimpering, “I should’ve” or “why didn’t I?” They have to bury their negative sentiments and concentrate on the future…where they should all strive not to repeat their mistakes! ABOUT BEST-SELLING AUTHOR LOREE LOUGH:Once upon a time, best-selling author Loree Lough (literally) sang for her supper, performing before packed audiences throughout the U.S. Now and then, she blows the dust from her 6-string to croon a tune or two for her grandchildren but mostly, she just writes full time. Over the years, her stories have earned nearly 100 industry and “Readers’ Choice” awards, 7 movie options, and over eighty 4- and 5-star reviews.There are NEARLY seven million copies of Loree’s books in circulation, and by year-end of 2018, she’ll have 119 books (fiction and non-fiction for kids and adults) 72 short stories, 2,500+ articles in print.Loree loves sharing learned-the-hard-way lessons about the craft and the industry, and her comedic approach makes her a favorite (and frequent) guest of writers’ organizations, book clubs, private and government institutions, college and high school writing programs both here and abroad. A writer who believes in “giving back,” Loree dedicates a portion of her income to Soldiers’ Angels, Special Operations Warrior Foundation, and other worthwhile organizations. She splits her time between her home in the Baltimore suburbs and a cabin in the Allegheny Mountains, and shares both with her real-life hero Larry, who rarely complains, even when she adds yet another item to her vast collection of lighthouses, wind chimes, and “wolf stuff.”Spreading the word about this book increases the opportunity for it to go to a feature film as Kevin James O’Neill intended. In addition to her other charities, royalties from 50 HOURS go toward Cancer Research. Loree fan or booklover, definitely, add this one to your reading or gift list! I’m writing to let you be aware of what a extraordinary experience my cousin’s princess found reading your web page. She came to find numerous pieces, most notably how it is like to have an awesome coaching mood to make many people without problems thoroughly grasp a number of complicated matters. You actually did more than our expected results. Thank you for supplying such important, healthy, explanatory not to mention easy tips about your topic to Janet.